Engine Stands are Great for Working on Engines! 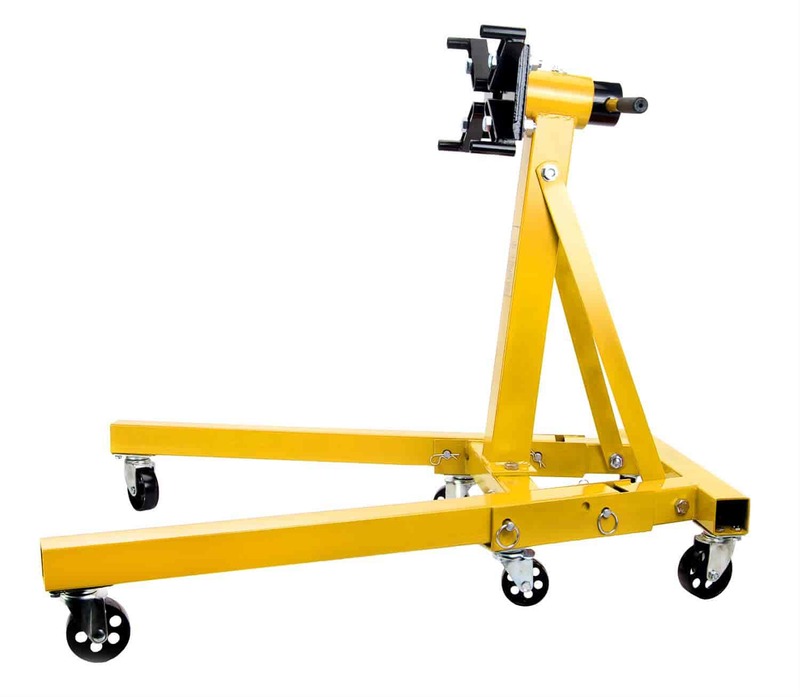 An engine stand provides the flexibility to rotate the block to any position for lower and top end engine reassembly with just the turn of a handle. JEGS Engine Stands have an adjustable mounting head that secures the rear of the engine to the stand and a 360 degree head that allows easy rotation of the engine. The heavy-gauge square steel tube frame disassembles effortlessly for storage or transport, and ball-bearing casters maneuver smoothly across any floor. Engine Stand Bolt Kit 555-80043 is available separately. 80042 is rated 4.4 out of 5 by 24. Rated 5 out of 5 by GOinTN from Great stand Can't beat the price of this stand. Hard to believe there's any money to be made here. It's Solid, heavy duty. Easy to assemble. I'm not sure why, but it doesn't come with 2 plastic handles for the rotator. TECH TIP... you will see people complain that the legs of this stand dont fit between the legs of the engine hoist making it difficult to transfer the engine from hoist to stand. While that is true, its much easier to mount the rotator assembly to the engine first and then slip the base of the stand onto the rotator. Rated 5 out of 5 by DKS15 from Awesome Very helpful, my stand is currently holding an 87 Johnson 300 outboard motor. Rated 5 out of 5 by The Mog Guy from Well built Well built, easy to assemble, package arrived in good shape. It did meet my expectations. Rated 5 out of 5 by Slant 6 from Very solid engine stand! This is the third engine stand that I have bought and the first one that I really liked. It is a very solid, well built and stable stand. An excellant stand for a really affordable price. JEGS 80042K - Engine Stand Kit 2000 lbs.